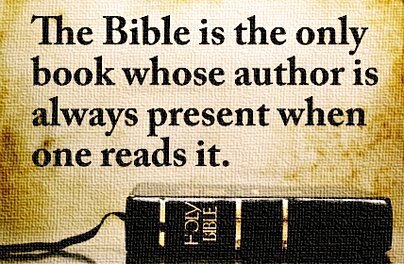 Your Nickel's Worth: The Bible is the only book whose author is always present when one reads it. The Bible is the only book whose author is always present when one reads it. How can others understand the Scripture unless someone explains it to them? We should rust to sit with our fellow man or woman when they read Scripture. We should rush to explain it to them in light of Christ. Not only that, but we can apply this very message to our own lives. What about those times we run into a passage of Scripture we find difficult? Should we give up? No, we have many options. We can turn to a fellow Christian and ask for discernment. More importantly, however, we should remember that, as I’ve said before (a quote from a source I cannot remember), “The Bible is the only book whose Author is always present.” The Holy Spirit not only inspired Scripture, but is also omnipresent and ready to fill us with His Word whenever we approach it. We therefore have access to the Author of Scripture whenever we open the Bible.